The first generation of immigrants from the Middle East began arriving in the late 19th century. They were mostly Christians from the Greater Syria province of the Ottoman Empire, which comprised modern day Syria, Iraq, Lebanon, Palestine and Jordan. Some came to escape religious persecution in the Ottoman Empire, but most came for economic opportunity, as, like most immigrants, they felt that the United States would offer them the opportunity to build a better life. The typical Arab immigrant of that period was young, male, single and Christian. Most were illiterate and spoke little or no English. Many planned to stay in the United States only until they had saved enough money to return home with more money and greater status. Many moved to major cities, like New York, Los Angeles, Detroit and Boston, and became peddlers. Among other things, they peddled religious items, embroidery, baked goods and confectioneries, which were often made by their wives. As it became clearer that women and a family were an economic asset, more men returned to the Middle East to marry and come back to the United States with their wives. Over time, Arab immigrants saved money and invested it in small businesses. As their financial conditions and personal lives became more stable, Arab Americans settled in cities and established communities, which included churches, clubs, societies and publications. While they spoke Arabic, these early immigrants did not identify as Arabs. The Ottoman Empire was the dominant power in the Middle East during the late 19th Century, and nearly all of the immigrants from the Middle East came with passports and identification papers issued by the Ottoman Empire. The terms “Turk” and “Syrian” were used interchangeably, including on Port of Entry records. As a result, the immigration figures from the Middle East for that period are not particularly accurate, as Armenians, Turks and Arabs were all identified as subjects of the Ottoman Empire. When the Ottoman Empire collapsed, most Arab immigrants began to identify with the region in the Ottoman Empire from which they came, usually Syria or Lebanon. By the 1920’s, there were an estimated 250,000 Syrians, Lebanese and Palestinians in the United States. Most were engaged in commercial activities, but some worked in the industrial plants of an emergent Detroit, as well as other cities. The community continued to advance economically, with peddlers establishing stores or small manufacturing plants, while importers imported items from the Middle East, ranging from rugs to olives. During the First World War, immigration from the Middle East dropped, but a second wave of migration began in the 1920s, as relatives of those already living in the United States began to immigrate and, seeing the success of those living in the United States through their remittances back home, new immigrants decided to join them. The second wave of immigrants was different than the first in that it contained a significant number of Muslims. By the 1950s, Arab immigrants had settled in major cities across the United States. From the 1950s on, a new type of Arab immigrant began arriving – literate, qualified and bilingual. Immigrants in the 1950s and 1960s pursued white collar or professional vocations, or sought educational opportunities. This group was about 70 percent Muslim and came from across the Middle East, particularly Egypt, Palestine, Yemen, Syria, Jordan and Iraq. In the late 1960s, following Palestinian displacement in the wake of the 1967 Arab-Israeli War, a large number of Palestinians emigrated to the United States. 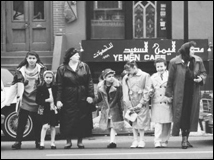 Given their unique circumstances, they brought with them a greater ethnic pride and political awareness that would ignite the development of an Arab American identity and spark the community’s political activism in the 1970s and 1980s. Even for some second- and third-generation Arab Americans, who had few remaining attachments to the Middle East and barely spoke Arabic, the ethnic and political consciousness of the new arrivals helped generate a greater awareness of their Arab heritage. The greater ethnic and political consciousness of the late 1960s and early 1970s became institutionalized in the 1970s and 1980s with the creation of several Arab American organizations, including the Arab American University Graduates, the National Arab American Association, the American Arab Anti-Discrimination Committee and the Arab American Institute, as well as a number of other local, professional and family organizations. These organizations would consolidate and transmit Arab American identify for future generations, promote an accurate and positive image of Arab Americans and protect the rights of Arab Americans. These functions became increasingly necessary, as events in the Middle East, from the oil embargo to hijackings, combined with well organized media campaigns to link Arab Americans with terrorism, made Arabs and Arab Americans increasingly stereotyped and suspect to many Americans. These functions grew in importance in the 2000s, following the September 11, 2001 attacks on the United States. In the aftermath of that event, Arab Americans were subjected to hate crimes, racial profiling and discrimination. In responding to these circumstances, in the 2000s, Arab Americans became a leading voice in the civil rights community of the United States. They have also become a major force in helping to bridge the chasm of misunderstanding that separates many Arabs and Americans. In pursuing these roles as a community and in contributing to the United States in a myriad of other ways as individual citizens, Arab Americans have become a vital and valuable thread in the beautiful tapestry that is America. NOTE: Much of the information from this section is drawn from, and can be found in, the Arab American Almanac.